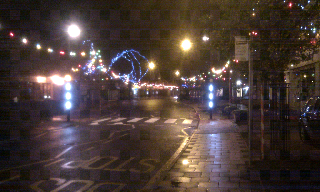 Our first Christmas since moving to Portishead is coming up, and the lights were switched on on Monday. It's nice to see how festive the high street looks with a bit of extra colour, and no gaudy flashing snowflakes or Santas here thank you! I'm not sure the phone camera photo really does it justice though. Let the counting down begin! You may remember that I migrated the Heswall Disabled Children's Holiday Fund website to Google Apps a couple of weeks ago, and started to use Google Sites for the web pages. One of the things I'd been wanting to do for the camp is create a blog where news and developments can be published. Google Sites offers an "Announcement" page type, but it's not really as nice to work with a Blogger, as I had discovered here already. But the trouble with trying to combine a Blogger blog with a Google Sites website, is that both use templates neither of which can easily be made to be part of the other. newPageHTML = newPageHTML + "<p><a href='"+rssUrl+"'>Subscribe to Posts (Atom)</a></p>"
Pretty simple, and seems to work ok. Admittedly at the time of writing, there's only one entry to publish, but I don't think more should be a problem. I'm a big fan of the legends of King Arthur - when I was at school I never really liked history much, and gave it up as soon as I could. In the last year that I had to do it (aged 13), part of the year's work was to do a "research project" on some event in history, and I chose to weigh up the truth in the legends. Having never really managed any better than the bare minimum of necessary homework, I'm not sure the teacher entirely believed it was my own work when I got one of the highest marks in the school. I still have the report I wrote - maybe one day I'll type it up for posterity. First there was Mary Stewart's Crystal Cave trilogy, which I read on and off over about 3 months last year. The story is the life story of Merlin, rather than Arthur. It's a good trilogy, with quite a believable mixture of magical legend and what can easily be believed as the hardships that people living in the first millennium A.D. might have had to put up with. Next, there's the BBC's Merlin, now in its fourth season on BBC1. A more light-hearted take on the stories would be hard to find, and yet the main characters of Uther, Arthur, Merlin, Morgana, Guinevere (or Gwen) and others are familiar, as are some of the storylines for each of them. Then after being given a Kindle 3 for Christmas last year, I downloaded Bernard Cornwell's Winter King - the first in a trilogy about Arthur, which I'm about 90% through, and I'm certainly enjoying his portrayal of Arthur as a successful warlord at a time of many Briton tribes fighting off attacks from the invading Saxons. If those three different versions of the same stories weren't enough, Channel 4 brought out a new Arthur TV series, Camelot - which I mostly missed when it was first aired, and is now being repeated on More 4, and I've got set on Series-Link record - hopefully the stories will be good, and Channel 4 "Drama" won't have relied too much on the raunchy scenes featuring Morgan and Guinevere - not that they're bad scenes, it's just nice to think you're watching something better than a tabloid newspaper. If you're a fan of historical fiction, I heartily recommend the Mary Stewart trilogy, and if the first book is anything to go by you wouldn't do badly from the Bernard Cornwell books either, although if you've read other books by him the formula will be familiar! Right, I'm off to go and catch up on Merlin! Making sloe gin is a bit of a tradition in my family - I can remember helping my Grandpa George pick berries along the valley from their house in France well before I was old enough to enjoy the results, and my Dad has been making his own since they moved house to the country about 15 years ago. I've been making my own for about 8 years, I think - the quantity produced has gone up a bit with the acquisition of one of those 5 litre size whiskey bottles, and a wine-making demijohn, so I can make a good few litres a year now. At home, discard any leaves, stalks, insects, shivelled berries, etc that you might have picked with your sloes, and then wash and dry the berries. Take the sloes out a couple of hours before you're going to make the gin - do not allow to completely defrost - they go a bit mushy. From the bottle's volume, add 12.5-15% of the volume but in grammes of caster sugar to the sloes, depending on how sweet you want it to be. e.g. for a 1 litre bottle, I add about 130g caster sugar. Fill the bottle with gin - I normally use local supermarket's half-decent London Dry Gin. Put in a cool cupboard, and upend once a week to make sure the sugar mixes. In our family, sloe gin is enjoyed with some good quality plain chocolate and a few games of racing demon. As some of you know, I've been helping a charity that runs a camp for disabled children, Heswall Disabled Children's Holiday Fund, for nearly 15 years - an organisation that has been very close to my heart ever since - and not least because it was there that I met Clare, who eventually became Mrs Potes in July 2006. One of the things I do for the charity is do the best I can creating and maintaining their presence on the internet - and I'm no web designer, I can tell you. Until recently, I was using hosting space with my very own hand-crafted HTML - it wasn't bad, but it wasn't that great either, and because of the hosting it was costing money. So in the interest of saving the charity a bit of cash, I started considering the options for replacement. The domain I use for this blog is hosted using Google Apps, which I've been using for many years now, so that seemed the obvious choice. The maturity of Google Sites (which was added a couple of years ago) meant that I could create the site in a much more WYSIWYG way, and importing the content from the old site took half an hour while I ate my sandwich in front of my computer at work one lunchtime. To complete the migration, I reverted the DNS settings for the HDCHF domain, and added the required CNAME entry for the "www" subdomain, and MX records for email, both of which Google provides you instructions for, and away we went. I'm no DNS expert, but it seems CNAME entries can be used to create domain redirections, and provided the server that they redirect to can interpret the path part of the URL, you can use them in just the same way as URLs referencing subdomains declared using A records (where the hosting server is contacted directly). As Google Apps basically gives you (almost) all of Google's products wrapped up with a bit of enterprise-y management stuff, and so we've also got the usual range of calendars, docs, gmail, and so on - whether I can convince the other committee members (whose ranks I have just joined) to use them will remain to be seen. The only downside is that as a UK Charity we do not qualify for the not-for-profits version of Google Apps (boo, hiss!! ), so we're restricted to just 10 organisation users - everyone else will have to use their normal email address, enabled for Google use - I hope this won't stop them using the private wiki site, also transferred to Google Sites. It may well be that I'm late to the party (again! ), but over the weekend I was looking at the two factor authentication that Google have made available for all accounts. Anyone that's done any remote working is probably familiar with RSA Tokens where you have a key ring that gives you a unique number every 60 seconds to use to log in. Using the Google Authenticator app on your Android device (other device manufacturers are available, I'm told), you get the same functionality. The setup of two-factor authentication is actually pretty simple - first set it up to work via your mobile phone, then re-login and add your device. If your device is also your mobile phone, you'll want to change the phone number used as a secondary authentication device - mine is switched to Mrs Potes's phone. Once this is done, your account will be expired from all of the connections you had to it (Google Talk, Chrome Sync, Android device, etc. ), and as those things ask you to reconnect, you just have to log in to http://accounts.google.com, click on the Authorizing Applications & Sites link, and generate a new password that will then be the password for that application only.